Note that this project is currently not maintained. 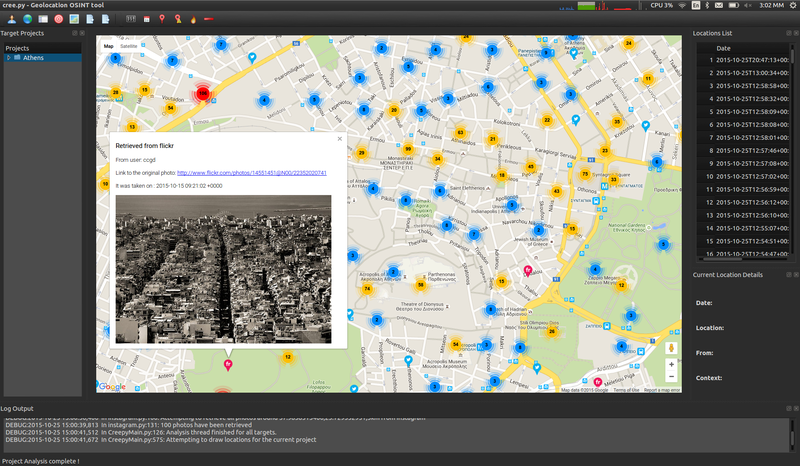 Creepy is a geolocation OSINT tool. Gathers geolocation related information from online sources, and allows for presentation on map, search filtering based on exact location and/or date, export in csv format or kml for further analysis in Google Maps. Create a new project : Creepy -> New Project -> Person Based Project . Search for the target selecting the available plugins. The locations will be drawn on the map, once the analysis is complete. Filter locations, export locations, view them on the map. Download and run the installers from this page. Default installation location is your user directory. Debian package will be updated and available in the repositories soon. Stay tuned ! Download the .dmg file from above, double click on it and drag 'n drop it to your Applications folder!